We will be waiting on arrival at the Juan Santamaria Airport to take a private transfer to your hotel in La Fortuna de San Carlos. This journey takes approximately 2.5 hours, passing through several villages in Costa Rica. 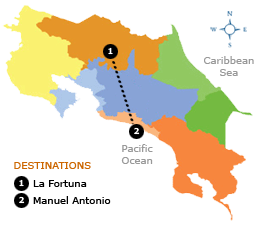 We can also pick you up at any hotel in San Jose and Alajuela, as the beginning of the trip. After checking in at the hotel, you have the afternoon free to rest. After the first night in La Fortuna, have the opportunity to enjoy a delicious breakfast at the hotel, besides the relaxing pools. During the afternoon be prepare for a tour in Arenal Volcano National Park, the pick-up is at about 1:30pm. After a short walk at the base of the "Coloso Arenal", we will take you to enjoy the Baldi Hot Springs. This will be your last day in La Fortuna, so enjoy your breakfast at Hotel and be ready to experience a really nice tour, the Horseback Riding to the waterfall. After the hotel check-out (2pm) you will take a shuttle directly to Manuel Antonio. The arrival is at dusk, so it is time to rest or go out. We hope you enjoy your first sunrise on this beautiful beach, Manuel Antonio. During the morning we will pass by the hotel, to take a visit to Manuel Antonio National Park, one of the most visited parks in Costa Rica. After the return to the hotel, free afternoon to enjoy the facilities. This day will be entirely yours, to enjoy Manuel Antonio Beach. Sun, sea and sand! Everything you need for an unforgettable day and relax during your well deserved vacation. Admire the last sunrise in Manuel Antonio, because we must return to real life. We will pick you up the hotel towards San Jose airport where you can take your flight back home. The drop off can also be at any hotel in San Jose or Alajuela. • Hotels in La Fortuna: Montana de Fuego (Bungalow) - Los Lagos (Standard) or Magic Mountain (Standard). • Hotels in Manuel Antonio: Costa Verde (Studio) or California (Deluxe).